PROSTAT™ is a naturopathic product containing two scientifically proven, hypoallergenic flower pollen extracts. Formulated especially for men, PROSTAT™ helps the body improve urine flow naturally. 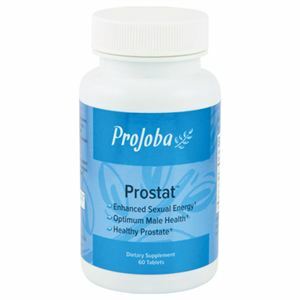 PROSTAT™ supports vitality and endurance and helps the body achieve and maintain a normal and healthy prostate. BENEFITS: Enhanced Sexual Energy, Optimum Male Health, Healthy Prostate. WARNING: For adults only. If you are pregnant, nursing or taking medications, consult your healthcare professional before using this product. In case of accidental overdose, call a physician or poison control center immediately. Store at room temperature and avoid excess heat above 104⁰F (40⁰C). KEEP OUT OF REACH OF CHILDREN. Ingredients: Proprietary Blend: Graminex G63™ Flower Pollen Extract (concentrated pollen extract [Secale cereale L.] [Standardized extract 20:1]; [G60:GFX]). Microcrystalline Cellulose, Maltodextrin, Silicon Dioxide, Calcium Stearate, Monocalcium Phosphate, Hydroxypropyl Cellulose, Gum Arabic and Opadry ns.